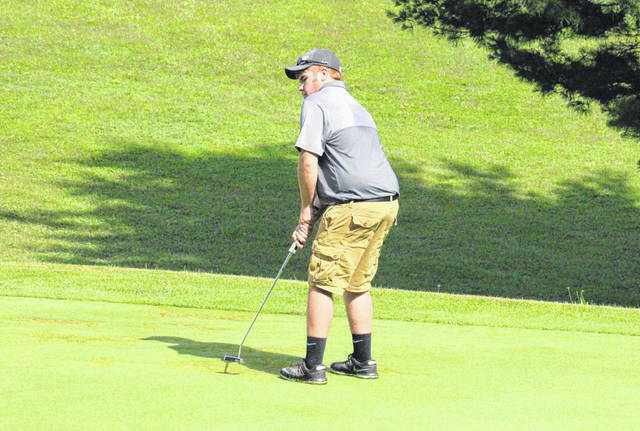 Wyatt Nicholson putts on the second green at the Meigs County Golf Course, during the Capehart golf league on June 25 in Pomeroy, Ohio. Jarret Hupp tees off on the third hole at the Meigs County Golf Course, during the Capehart golf league on June 25 in Pomeroy, Ohio. MASON, W.Va. — Perhaps the best question of the day would have been which was warmer the temperature or the golf being shot at the Riverside Golf Course. A total of 41 golfers teed off on Monday morning, chasing the point lead in each age group. The conclusion of the day’s play did not provide much of an answer. Only two groups, girls age 13-14 and girls age 18-19 have leaders that cannot be reached. The 41 young men and woman that participated was the largest group in many years, the golf course was lush and green, and the overall condition was as good as it has been in some time. Several of the players expressed their pleasure at the condition of the course. The best score of the day was shot by a member of the 10-and-under age group, as Grant Roush recorded a 36. Even with that score on file, Grant remains in second place in the race for the winners plaque. Grant’s point total of 20 places him 4 points behind current leader Alec Conway. Riley Cotterill is now third with 15 points, a single point ahead of Mason Morris. Also playing in this age group today was Noah Leachman, Timmy Russell, Blake Fackler and Porter Midkiff. Ali Norris now has a point total of 28 point and cannot be caught at this point in time. Kyrstin Fackler is second with 10 points while Teagan Conway is third and Brooklyn Smith is fourth. The age group for the 11-12 year olds is deadlocked for both the young men and the young ladies. As strange as it may seem, the leading point total for both the guys and girls is 27 points. 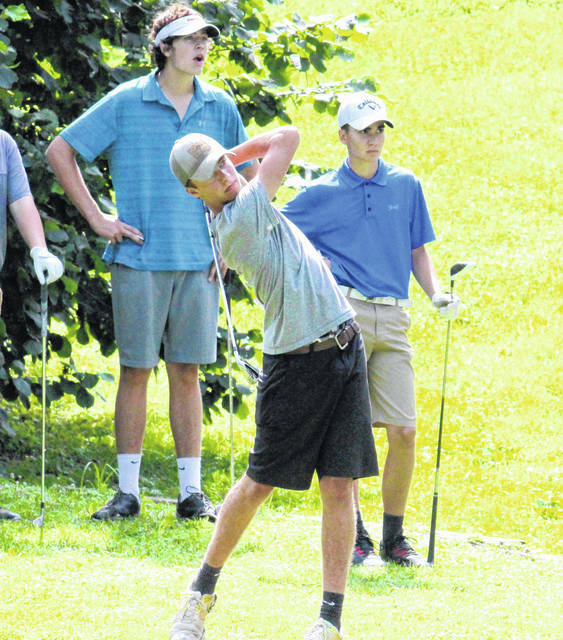 Joe Milhoan and Caleb Pierson will face off next week at the Meigs County Golf Course to determine a possible winner. The same situation exists for Marlo Norris and Lorena Kennedy. Cole Miller finished third for the boys in this group, while Evan Pope and Ethan Roberts also played in this group. Kyra Collins finished just one shot behind Lorena in Monday’s competition. Brennen Sang shot the low score for the boys 13-14 year old group. Brennen now has accumulated 18 point, but trails Landon Atha by four points. Landon finished third to increase his leading total to 22 points. Second in Monday’s scoring was Ethan Short, who turned in a 59 for his effort. John Greer was fourth and remains in fourt place tie in the point race for this group. Jacob Spencer ended up in fifth place, while Zack King’s sixth place left him in a tie for fourth place in the point race. Kael O’Brian played in his initial effort go earn his first points of the season. On the ladies side of this group, Caitlin Cotterill scored 54 for the day. Caitlin now has 29 points for the season and cannot be caught regardless of next week’s results. The largest group of player’s today were the young men in the 15-17 year old group. A total of 11 young men participated with three of them, Wyatt Nicholson, Jarrett Hupp and Justin Vogt, tying for first with a score of 39. Fourth place went to Whitney Byrd with a score of 40, while Jensen Anderson turned in a 42. Andrew Vogt was next with a 44, while Ryan Harbour shot a 47. Matthew Morris, Gus Kennedy, Isaac Roush and T.J. Vogt also played in this group. Wyatt and Whitney are tied for first in the point race, with 23 points apiece. Jarrett is still in the picture with 18 points. First place for the girls today in this group was Kylee Tolliver, who turned in an excellent score of 39 for the day. Kylee earned 10 points for her effort, and she trails Haley Pierson by 10 points. If Haley participates next week, Kylee cannot match Haley’s total. Another very close effort exists in the boy’s 18-19 year old group. Levi Chapman and Douglas Workman both shot 40 to tie for first. The point total for both of these young men is now 27 setting up a showdown for next week’s matchup. Bryce Swatzel shot a 52 and now has accumulated 18 points for the season, while Theo McElroy’s 54 earned him fourth place. The points earned by Kaitlyn Hawk assured her of winning the point race for this season in her age group. All of the day’s players were provided a lunch after the conclusion of play. Next week’s tournament will be held on Tuesday, July 10th at the Meigs County Golf Course located just North of Pomeroy, Ohio. The entry fee will be $10.00 per player that will include a small lunch. Play will beginning at 9:00 a.m. with registration starting at 8:30 a.m. Play is open to all area youth age 19 and younger. Please contact any of the following if you have questions : Jeff Slone, 740-256-6160, Jan Haddox, 304-675-3388 or Bob Blessing, 304-675-6135.
https://www.mydailysentinel.com/wp-content/uploads/sites/14/2018/07/web1_7.5-MHS-Nicholson.jpgWyatt Nicholson putts on the second green at the Meigs County Golf Course, during the Capehart golf league on June 25 in Pomeroy, Ohio.